Welcome to our export toolkit. With our local Exporting is GREAT partners, we have brought together information, guidance, tools and tips for exporting businesses, whether you are an experienced exporter looking at entering new markets or just starting out on your export journey. You will also find links to agencies who are experts in their field and who will be happy to advise further on a one-to-one basis. We hope that these resources and information provide you with a good insight to the steps you need to take to grow your business in international markets, safely and securely. Below are some exporting resources, events, support and finance schemes designed to help you grow internationally. 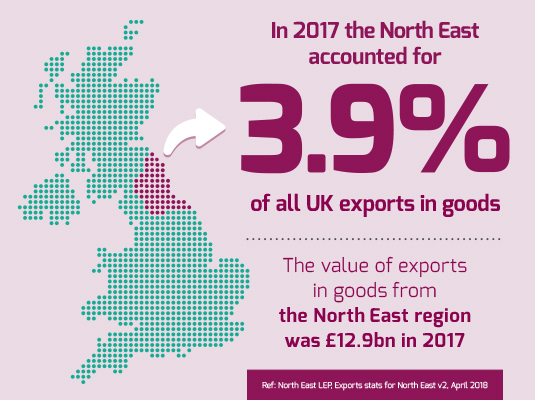 We’ve also spoken to some North East businesses who have benefitted from exporting - read their stories below. Frank Recruitment Group's inspirational export success story that has seen it open 16 offices on four continents.